I am rarely away from my phone or computer, but at the end of the day, I am a hand written planner person. And I’ve tried so many—but in 2017, I found my ultimate planner: Get To Work Book. This planner has been a life saver & a game changer. There are so many reasons as to why I adore it, and we will go through them all in this post! Also, can I just throw this out there—I’m not into super chic & girly planners! I really wanted something that could represent the casual and some days tom-boy me. Get To Work Book has got it down! Get To Work Book currently offers months from January 2019 to December 2019, although in previous years other versions have been released, such as summer to summer planners. It comes in two colors: black & chipboard (brown). You may also choose to purchase only the planner inserts to place in your own binding. The planner sells for $55, but if you purchase the inserts only, it sells for $46. Finally, Get To Work Book is only sold directly through its website or partnering boutique sellers—you will not find this planner at any major retail store. 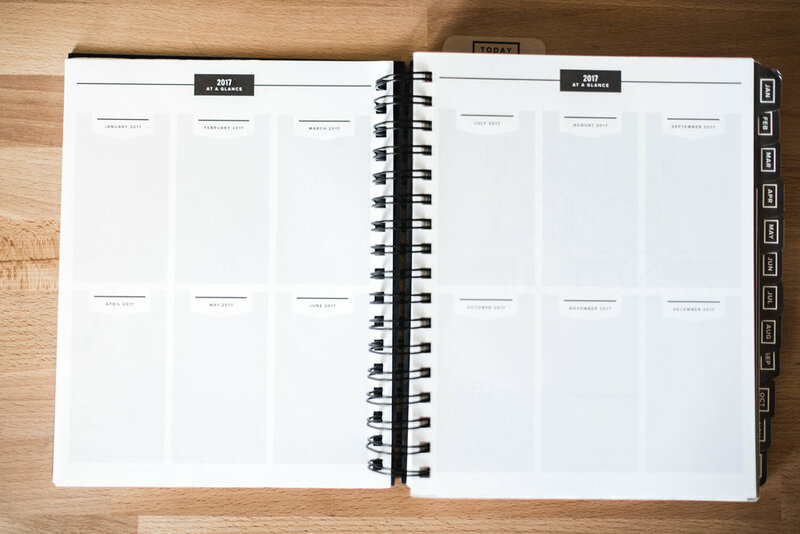 At the beginning of this planner, you’ll find your year at a glance—this is seriously one of the best and most helpful parts of this planner! I love that I can write down huge events in this section and glance at my year! And get this—there’s another year at a glance at the back of the planner too for the following year, just in a calendar format! Every month has a perforated sheet that contains a motivational typography print! Here, you write your top goals for the month. Every month takes a two-page spread, and personally, this is the setup I prefer. There is also a notes section at the bottom of the calendar spread, as well as the previous and following months in the bottom left corner of the spread. Your weekly spread is also a two-page spread (again, my preference!). Each week contains a “top three” for the week that is in the far left of the spread, and each day also contains a “top three” that is at the top of each day. Similar to the monthly spread, there is a gridded note section at the bottom of the spread for you! Also at the end of each month is a reflect and goal set page to help you stay on track (or get back on track) with your goals! Guys…this planner is sharpie bleed proof. Yep! All of the paper in this planner is made to withstand the bleed of a sharpie! Also, the creator of this planner takes recommendations from her customers and works to improve the planner every year. I love that! Today Bookmark ($4): this bookmark fits into the rings of the planner, is see-through, and also a six inch ruler. Mini Grid Notepad ($8): this little notepad is just wonderful—I’ve already purchased it twice! I use it to write down my daily to-dos! Grid Stick Note ($8): I was so excited when these were released—they are very similar to the mini grid notepad, but they are also sticky notes! But for me, I still love the mini grid notepad more. To Do List Sticky Notes ($8): I was using these before the grid sticky notes were released, and not that they have been, I’ll be switching to those for good, but these are still pretty darn great! Book Band ($3): helpful for those of you who really stuff your planner! I have one of these and use it, but not all the time! But I’m happy to have one just in case my planner gets too full. Washi Tape - Set of Three ($10): I purchased these earlier this year, but I haven’t used them in my planner yet. Right now, I just love how they look and they’re staying in my crafting supplies until I think of the perfect way to use them! Project Breakdown Notepad ($10): I haven’t tried these but I’m seriously considering it! I love the price and I really love those project pages! Perpetual Calendar Notepad ($16): I’m a terrible perfectionist, so honestly I’ve been playing with the idea of getting these simply to try out new pens/colors and styles before using them in my planner! Not to mention, I could easily put this on my fridge! Get To Work Book just released their 2019 planner and you can purchase it right here, friend! At this time, there are no discounts for this planner, however, if you order this planner now, you’ll get a free mini grid notebook (not to be confused with the mini grid notepad)! I purchased my 2019 Get To Work Book planner this morning! Do you use another planner that you love? I’d love to hear about it! Leave a comment or message me directly! Thanks!